I recently took a trip to Dublin for four days with Mr Musings! We were long overdue an adventure after working harder than ever. I booked The Merrion Hotel, a beautiful 5* hotel located right in the heart of Dublin city centre and a proud member of The Leading Hotels of the World. Nearby to the hotel is a vast array of galleries, museums, pubs, restaurants and the shops of Grafton Street, so it’s perfectly positioned for those who love to explore. With 142 bedrooms and suites, the hotel has the excitement and buzz of a large hotel, but also the warm and welcoming family feel of a smaller, boutique hotel. The building itself is a stunning restoration of four Georgian townhouses, with a very ‘Mayfair’ feel due to the impeccably stylish decor, curated floral displays, high ceilings and impeccable 5* service. We felt very much at home right away and couldn’t wait for the dinner we had booked in The Garden Room. Our impressive suite was located on one of the upper floors of the Georgian Main House, overlooking the hotel’s private gardens. Suites are spacious and ideal for couples and families, with enough room to escape your significant other / kids, should you need some peace and quiet! Our suite was noiseless and we felt as though we were a million miles from the hustle and bustle of the city outside. A large and comfortable king-size bed for a peaceful night’s sleep. A spacious ensuite bathroom with high quality products. Charming Irish fabrics and period-style furniture in keeping with the architecture and interiors of the original 18th-century townhouses. A sitting room with a wonderful Georgian fireplace, dining room table seating four, a sitting area with a sofa and two armchairs and a coffee table with a selection of magazines. A music system, free Wi-Fi, multi-line telephones, cable/satellite television with movies available on demand for entertainment and relaxation. Air-conditioning for warmer days / nights. A writing desk with Merrion stationery for writing home, lists, fairytales or love letters. A Nespresso machine to kick-start your day and a fully-stocked minibar. The Merrion offers a diverse choice of dining options for guests and visitors, including the casual gastro-pub menu served in The Cellar Bar, the modern Irish cuisine of The Garden Room and the fine-dining experience at Restaurant Patrick Guilbaud* (the only restaurant in Ireland to hold 2 Michelin stars). There really is something for everyone! We had the pleasure of dining in The Garden Room, a bright and spacious restaurant on the ground floor of the hotel. We were met by a lovely waitress who suggested a terrific blush rosé that would go with both meat and vegetable dishes. She chatted to us, giving us some great recommendations of local quintessentially Irish haunts and hot spots. We were very impressed with the restaurant, service and food. Warm mood lighting and tasteful neutral decor create a relaxing environment to dine in. Fresh ingredients and perfect plating resulted in a high quality and memorable dining experience. The Tethra Spa offers many excellent treatments to soothe those experiencing the aches and pains of life. Designed to restore and rejuvenate, the spa menu is full of solutions to common ailments. Whether you’re looking to iron out some tight knots or to brighten dull and tired skin, the spa has something special in store for you. 1 hour antidote to pressure. The Tethra Spa therapist performs an Indian Head Massage followed by a soothing eye treatment to bring relief to overworked, over tired eyes. The treatment includes a steam inhalation to clear sinuses and restore balance. €100. This 75 minute massage with individually chosen essential oils. This complete face, scalp and body massage focuses on acupressure points, helping to strengthen the nervous system, thus restoring lost energy. €120. This 2 and a half hour treatment is ideal for those looking to relax or invigorate the body. Expect the ultimate series of treatments to detoxify, replenish and revive body and mind. A salt and oil scrub prepares the skin for an intense aromatherapy massage. The experience is completed with a bespoke aromatherapy facial to rebalance needy skin and promote overall wellbeing. €220. We thoroughly enjoyed our stay at The Merrion. After discussing the many wonderful hotel features, Mr Musings agreed that the highlight of our trip was meeting some absolutely wonderful staff members who went above and beyond to ensure that our stay was flawless. The reception staff were friendly and always greeted us with a smile. Our waitress at breakfast spent time helping us to plan our itinerary for the weekend, offering insider information about hidden hot spots, iconic landmarks and popular attractions. 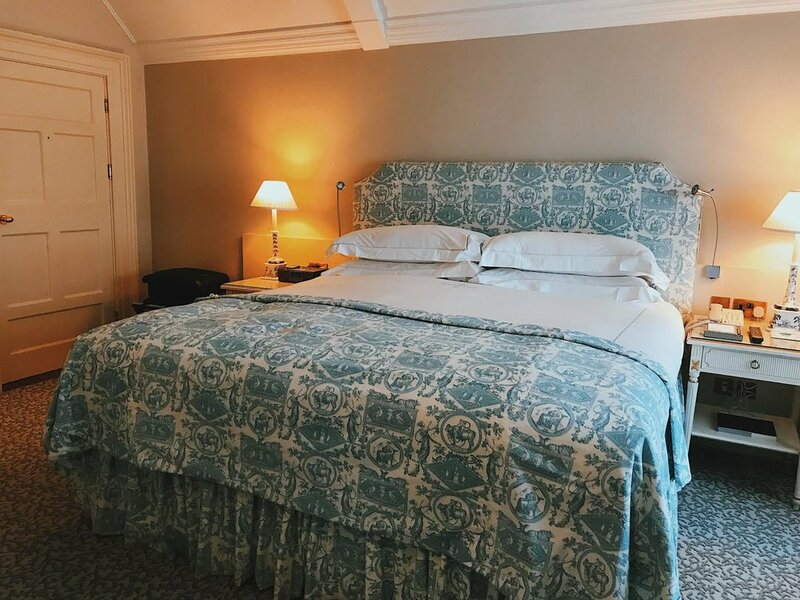 The Merrion offers guests a truly luxurious experience from start to finish and this was one of the best hotel stays we have experienced this year. Whether you are travelling on business or for pleasure, the Merrion is an excellent accompaniment to your Dublin experience . The Drawing Room - the perfect spot for afternoon tea! To book, please contact the hotel on +353 1 603 0600 or email info@merrionhotel.com. You can also book directly online here. For dining reservations, please call + 353 1 6030608.